The idea that you could lose weight by lying down on a table while needles are inserted probably seems ridiculous and right along the lines of Ouija boards and magic eight balls. Skepticism is good, but not in this case. Acupuncture has been proven effective at promoting weight loss for a number of reasons and is used widely as a weight loss tool in Overland Park. 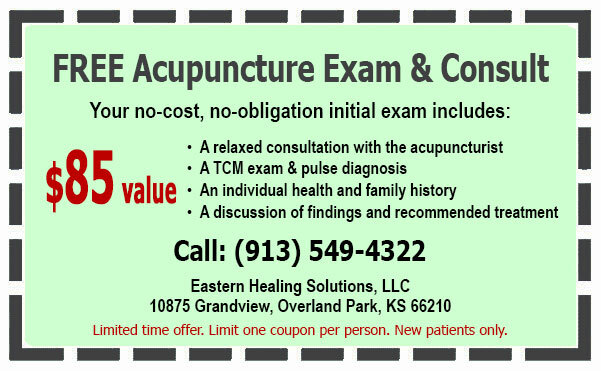 I want to thank you for visiting our Overland Park Acupuncture weight loss page, and in return I’d like to offer you a coupon for a FREE Initial Consultation ($85 value.) This coupon is good for one initial exam and limited to one coupon per person. If you, your friends, relatives or colleagues are ever in need of my services, please print out the coupon and bring it on your first visit. If you have any questions please feel free to e-mail me or call me at (913) 549-4322.